Looking out to crescent-shaped Hanalei Bay before descending into the Hanalei valley. The mountain in the background is Bali Hai. Every single time I’ve visited Hanalei, located on the north side of Kaua’i, it’s rained. Every. Single. Time. Sometimes it’s been a gentle rain, other times it’s poured, but every time I’ve gotten wet and the visit has been a miserable experience. But, Brett and I decided to try a lunch date there last week, and lo and behold . . . my losing streak ended! Oh, a few drops tried to start something, and although there were plenty of clouds around, actual rain never materialized. We had a wonderful time, and I finally got to visit several places in the small town that I’d been unable to see before because of the weather. 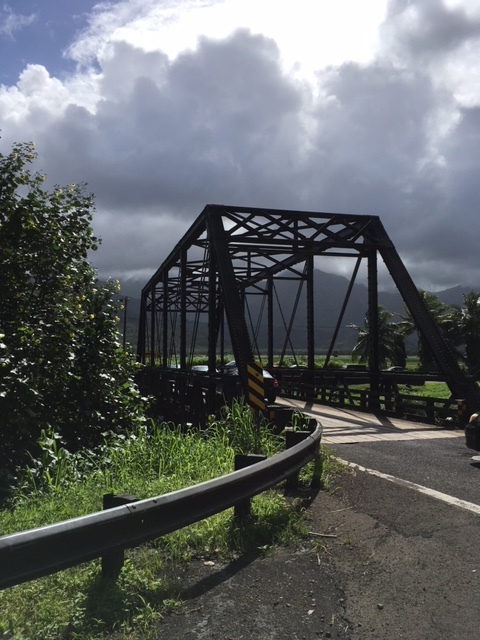 To get into Hanalei, the highway descends into the Hanalei valley, and crosses the Hanalei river by way of the historic one-lane Hanalei bridge. Vehicles go single file, up to five at a time, and then stop to let those on the other side cross over. Sometimes after heavy rains the river will flood and the bridge is closed, effectively trapping everyone in Hanalei and beyond until the water subsides. Tahiti Nui restaurant and bar. They have great food, great drinks and great live entertainment in the evening. We arrived in Hanalei just a little before noon, and decided to have lunch at Tahiti Nui. 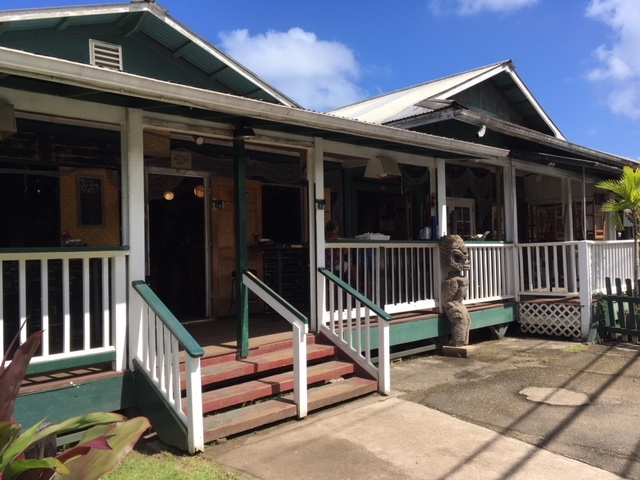 This is the restaurant in The Descendants where George Clooney’s character runs into his cousin (played by Beau Bridges) and they chat briefly at the bar about the upcoming family meeting concerning the sale of the family trust on Kaua’i. 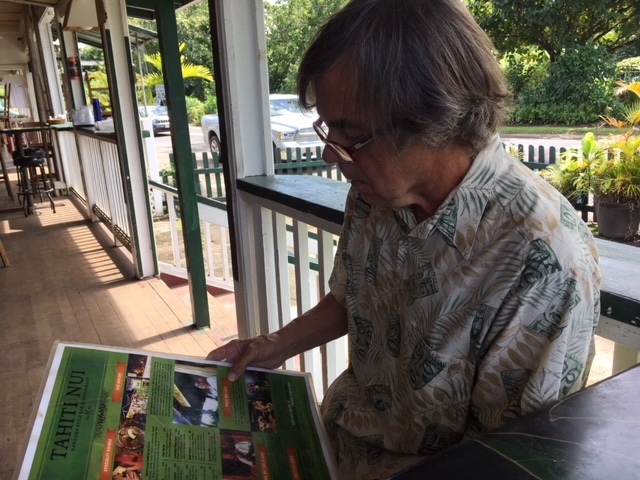 Brett peruses the menu at our table out on the lanai. We peeked inside the restaurant and thought it was kind of dark, but because we had fortunately arrived before the main lunch rush, Brett and I were able to snag a nice table out on the lanai. 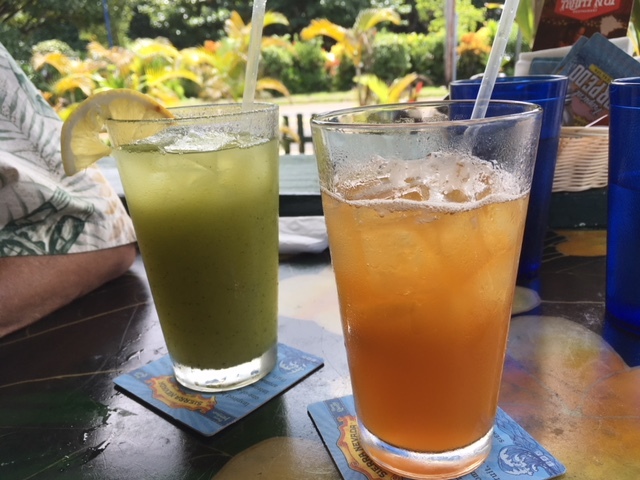 Our drinks were VERY delicious and VERY refreshing. Brett ordered a cucumber mint mocktail; I had a passionfruit sun tea with lemonade. Both were amazing. We brought home half of our pizza for YaYu, who said it was divine. 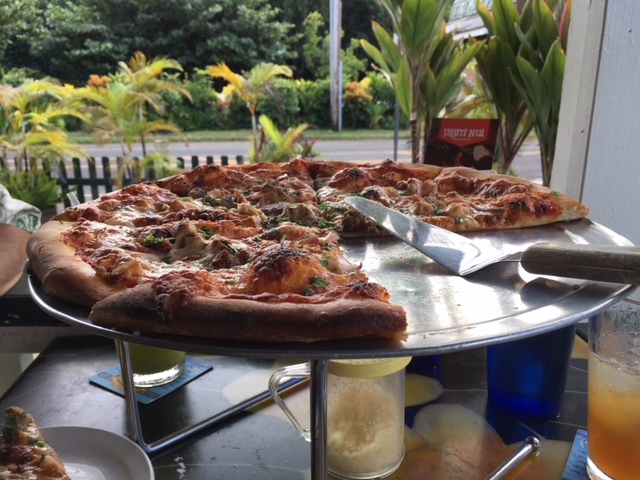 The waitress recommended the huli-huli chicken pizza, and it did not disappoint. So good! Yes, I ate carbs . . . and they were delicious..
Hanalei Pier, with Bali Hai in the background. After lunch we drove over to see the Hanalei Pier, which I had never seen before because of rain. We strolled out to the end to enjoy a spectacular view of Hanalei Bay, Bali Hai (the mountain in the distance), and also got to watch several kids doing flips into the water. The pier also gave us a great view Hanalei Beach (also featured in The Descendants). Even though it was cool-ish and quite breezy there were several people swimming or lying out on the beach. Threatening clouds appeared while we were viewing the church, one of Hanalei’s most famous landmarks. 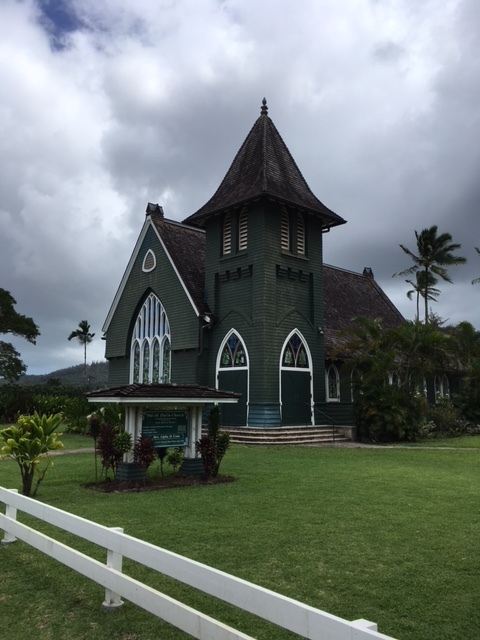 Leaving the pier, we drove slowly by and ogled as many of the beautiful beachfront homes as possible (some owned by people in the film industry), and then drove over to see the beautiful Wai’oli Hui’ia Church, founded by missionaries in the 19th century. It’s the oldest church on Kaua’i, and is listed on both the state and national registers of historic buildings. This was another site I had especially wanted to see, but had never been able because of the weather on previous trips. Someone’s happy with his coffee and biscotti! 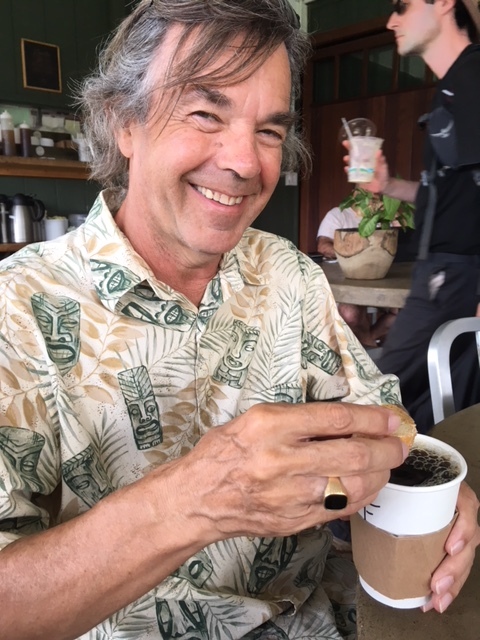 While we were at the church it began to look like my streak of bringing rain to Hanalei was going to continue after all, so we headed back into town and to the Hanalei Bread Company, a bakery and coffee shop, where Brett and I both got coffee and he enjoyed a tasty biscotti. A little friend joined us for coffee! 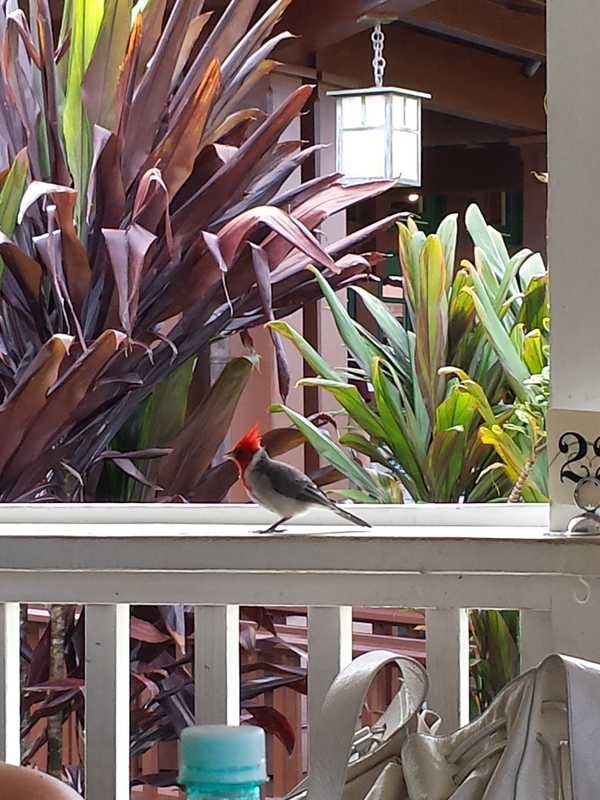 This little red-crested cardinal (or as we call them, Hawaiian cardinals) settled himself nearby while we sipped our coffee, ready to catch any stray crumbs that customers might supply. 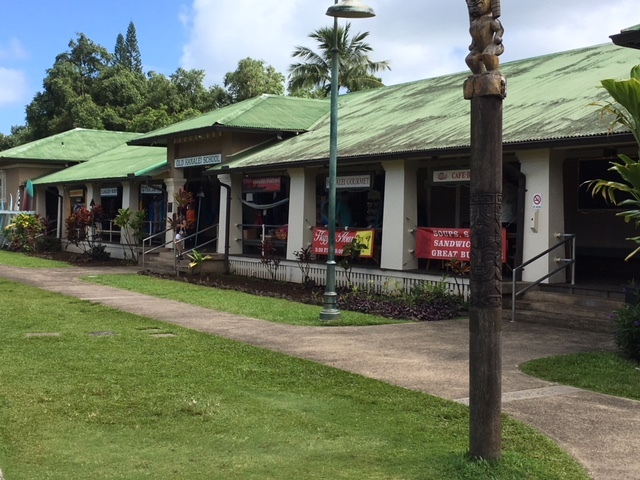 The Old Hanalei School is located in the center of town, right across the street from the I Ching Shopping Village. The rain thankfully never showed up! We were ready to go home though, and as we headed to our car we walked past the Old Hanalei School which now houses shops and a great restaurant, Hanalei Gourmet (where we’ve eaten before). 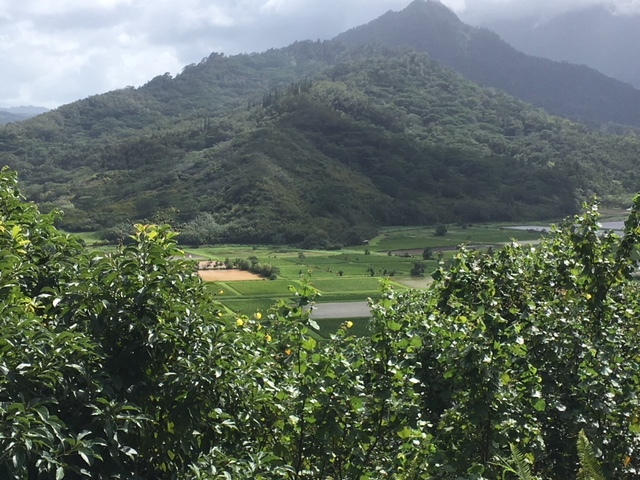 Hanalei’s full-time population is around 450, but there are probably at least three times that many tourists in town at any given time, and more shops and stores where they can spend their money than you can count. We were sad to learn though that our favorite Hanalei business, Kaua’i Nut Roasters, had closed. 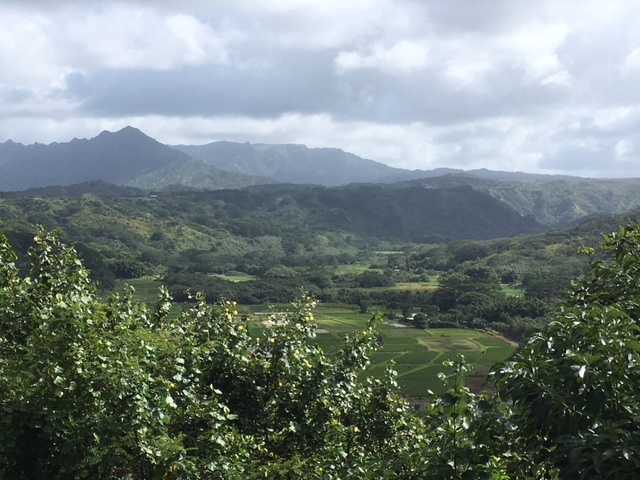 The taro fields of Hanalei Valley. 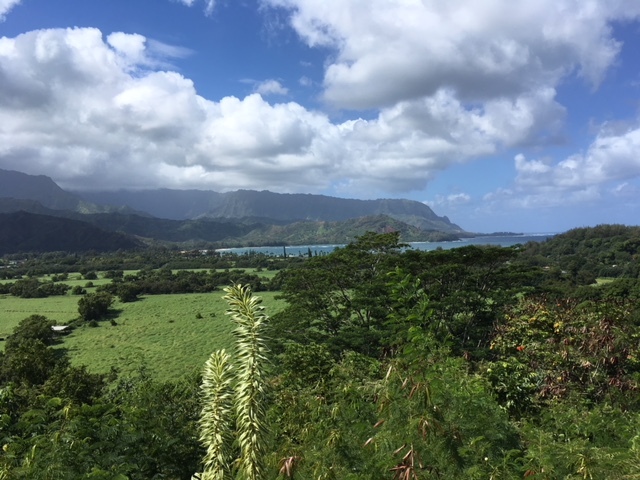 Once back over the bridge, up the hill and on to the highway, we stopped at the Hanalei Overlook, one more place I had never been able to see because of rain. There were lots of clouds around but the views were absolutely stunning. The valley is home to numerous taro fields. Taro is an important food to native Hawaiians, and is used to make poi. The view across the valley to the north, to Mt. Wai’ale’ale. We also had a terrific view to the north from the overlook, of more of the valley and of Wai’ale’ale. Looking out at the view, it was perfectly clear why Kaua’i is called The Garden Island. Brett and I had a lovely day, and a fun lunch date. 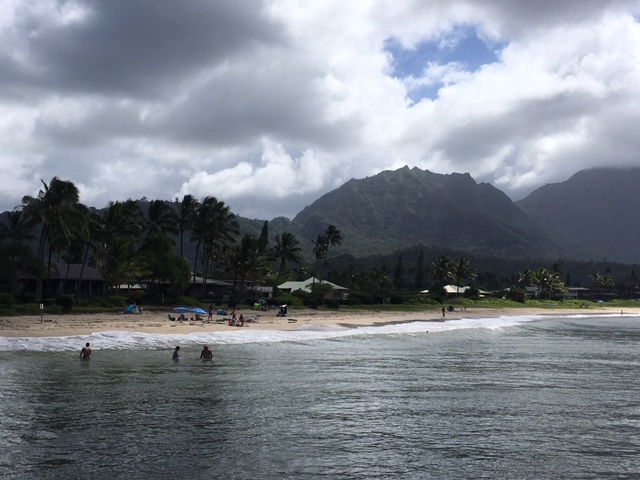 Now that my Hanalei rain spell seems to be broken, I’m actually looking forward to returning again, to enjoy the beach and take in more of the gorgeous views. What a gorgeous day you had! And, after thinking that that church looked awfully familiar I looked up my photos from our last visit to Kauai (our 3rd time there), and yes! I took a photo of it on the day we traveled to hike the first few miles of the Kalalau Trail. We are headed out for a similar ‘our town’ day today. We’re taking our new kayak over to our nearby harbor for it’s first paddle, followed by lunch. It was beautiful, even with the clouds and threat of rain for a short while. I’ve really had the worse luck there, but the day we went was great, and we had a good time checking out all the sights. I wish we could have spent more time at the church, but you can see that it looks like rain was ready arrive at any moment (but thankfully didn’t). 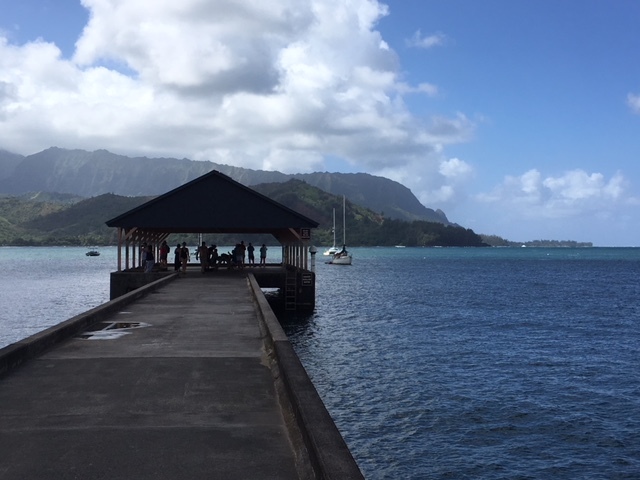 Hanalei is a stunning location, no matter what. I enjoyed my company that day too! Beautiful photos! I absolutely love pictures of mountains and water. Sounds like it was a wonderful day. We had a really good time, and the whole day was pretty much perfect from the drinks to the food to the scenery to the company. We’re looking forward to doing it again before we leave! I absolutely love Hanalei – the coffee roaster especially. And the sports bar in the middle of town is a great place to watch the Super Bowl! We love Hanalei too, but until this last visit it apparently didn’t like me! We were very sad to discover that Kaua’i Nut Roasters had closed – Hanalei was their flagship store – we loved their product. Maybe the shop is still open in Koloa, but haven’t been for a while so don’t know. We always stop at the coffee roaster when we’re there, rain or shine – it’s one of our favorite places too. Of course, you and Brett go to Hanalei much more often than my wife and me. But, in the three times we have been to that beautiful part of Kauai it has not rained at all. The next time we are on your home island maybe we should join up and see if our winning streak continues! Brett and our daughters have gone to Hanalei plenty of times and never seen anything but sunshine, but until our trip week before last I seemed to always bring the rain. It is an exceptionally beautiful area of the island – we love going up there. We’d love to get together with you and Betty, in Hanalei or anywhere else, if you make it to Kaua’i before we take off on our Big Adventure next year. If that doesn’t work out, maybe we can meet in Portland? We may actually make it back to Arizona one of these days as well – still lots for us to see and do there.